Well, it took a week longer than I wanted, but I finally finished my bustle skirt! Woohoo! I love how it turned out, and it looks even better when it is on me and there are actual legs to help fill the bottom part out. 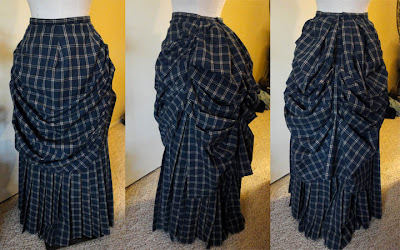 There is a ton of fabric in this skirt (8 yards of plaid + 3 yards of foundation), but all the fabrics are so lightweight that is isn't too heavy, and hopefully, it won't be crazy hot. I expect hot - I just prefer to avoid crazy hot. And now, I need to get cracking on that bodice! Just 2 weeks to go! It looks great! Can't wait to see the bodice. I like how you reworked the overskirt. It turned out pretty nice. It's beautiful! 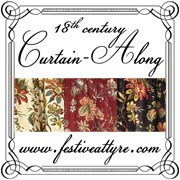 Love the fabric!! Sweet!!! Looks great Jen. The rework turned out awesome. That looks really great, Jen!